Chicago Mayor Announces More Tasers, Training For Police : The Two-Way Rahm Emanuel outlined the changes as activists continue to call for the mayor's resignation after yet another fatal shooting involving police over the weekend. Chicago Mayor Rahm Emanuel responds to a question during a news conference about new police procedures on Wednesday. As activists continue to call for Chicago Mayor Rahm Emanuel's resignation after yet another fatal shooting over the weekend involving police officers, the mayor announced a new round of police department changes that include more Tasers and better training. At a news conference Wednesday, Emanuel said the police department would double the number of Tasers from 700 to 1,400. He also said there would be changes to officer training. "There's a difference between whether someone can use a gun and when they should use a gun," Emanuel said at the news conference. "And we as a city must train for that difference." The mayor said: "Our police officers have a very difficult and dangerous job. They put their lives on the line so the rest of us can be safe. And like all of us, they are human and they make mistakes. [...] Willful misconduct and abuse cannot and will not be tolerated." Interim Police Superintendent John Escalante said the greater availability of Tasers would help officers think of force as a last resort, adding that police did not have a "shoot first, ask questions later" mentality. He also said officers would receive crisis intervention training. Lauren Chooljian, with NPR member station WBEZ in Chicago, reported that Escalante said front-line officers, who respond to the majority of calls, would receive the crisis training first. 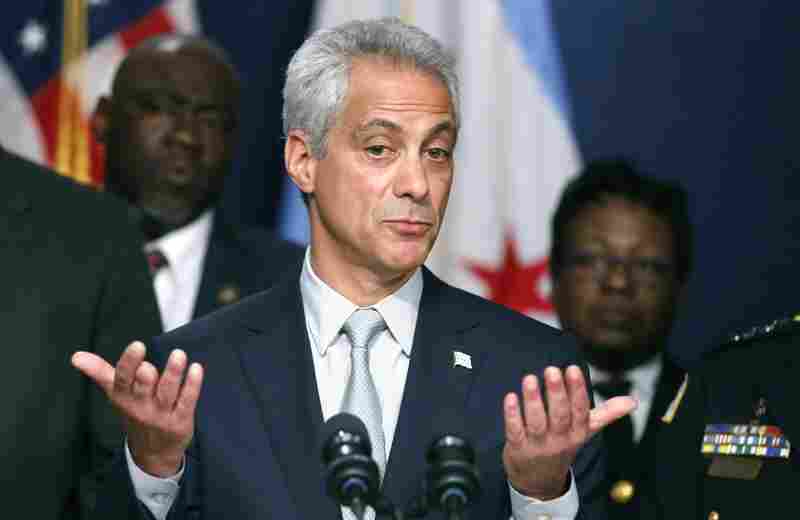 "Emanuel was asked why he didn't make such changes in the previous four-plus years in office. The mayor pointed to other moves he's made while acknowledging he hasn't done everything he could under his tenure. Emanuel said the problems are 'four or five decades in the making' and the changes will take time." The changes, on the heels of a weekend incident in which police fatally shot 19-year-old Quintonio LeGrier and his 55-year-old neighbor, Betty R. Jones, are Emanuel's latest response to the criticism surrounding police use of force and the city's handling of investigations into police shootings. Earlier this month, Emanuel created a "police accountability task force" that will "review the system of accountability, training and oversight that is currently in place for Chicago's police officers," a news release from the mayor's office said. That announcement came after a court forced the city to release a video from 2014 showing a police officer shooting a black 17-year-old, Laquan McDonald, 16 times. On Dec. 9, Emanuel held an emotional news conference apologizing for McDonald's death. Activists, however, have not been swayed by these moves and they continue to call for the mayor's resignation. On Tuesday night, a small group of protesters gathered at Emanuel's house, calling for his removal. As we reported, the group waited in the mayor's front yard as he returned from his vacation in Cuba, which he cut short to address this weekend's shooting. Emanuel did not talk to the protesters.